Newark has hosted many famous visitors. So far in our series on Knowing Newark, we have looked at several of the country's founders who were in town briefly during the American Revolution or early in the 19th century—mainly people who helped shape American history in those early years. But not everybody who has visited or been part of the local scene falls into that category. Throughout the years, Newark and the Newark area met with a British king and queen, a French marquis, a Dutch crown-princess, an Irish lord mayor, an African consulate general, and a British country knight whose grandson became a world-famous poet. Last June we noted the 1824 visit of French Gen. Gilbert Motier, the Marquis de Lafayette, hero of the Revolution, who was escorted across the Newark Meadows, introduced to the township ladies at a Military Park reception and was honored at a banquet at Judge Boudinot's mansion before an assembly of local bluebloods. In June 1939, Britain's King George VI and Queen Elizabeth, the present queen mother, visited the United States at nearby Monmouth County. Their New Jersey visit began with a welcoming committee, headed by Gov. A. Harry Moore and Red Bank Mayor Charles R. English, at the Red Bank train station. That was followed by a 12-mile, flag-waving motorcade to Ft. Hancock on Sandy Hook, where the royal couple departed by boat for New York City. In 1970 and 1971, the Netherlands Crown Princess Beatrix paid two visits to Newark. Then a princess, the present-day Queen learned much about Newark from Paul N. Ylvisaker, former state Commissioner of Community Affairs at a conference held in Denmark. At 33, the future monarch decided to visit Newark, she said, because 'America is so much the center of what is going on. And, so is Newark. If you can solve your problems here, then perhaps, maybe, it can be done in other parts of the world, too.' 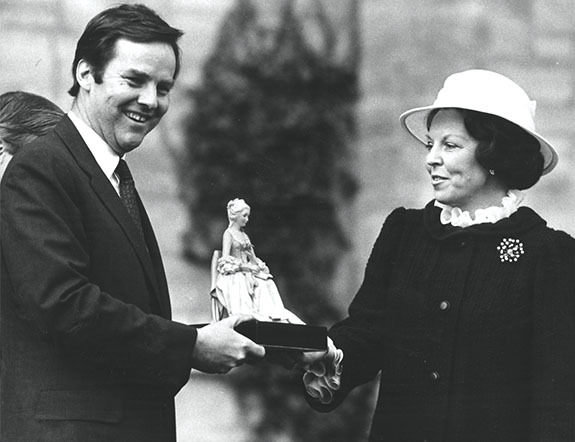 The princess and her husband, Prince Klaus, visited in April 1971 and were hosted at a Newark Museum lunch attended by Mayor Kenneth Gibson and Malcolm Talbott, vice president of Rutgers-Newark. In her 'adopted city, ' the future queen heard much about what was going on at a lunch of chicken soup, ham rolls, and cheese sauce and asparagus. Later Beatrix visited with Rose Decico, a 78-year-old Newark grandmother, and was a guest of the 11th Ward Italian-American Club at North Sixth Street and Third Avenue, where she drank Coca-Cola and discussed the status of the Italian community in the North Ward. On a previous visit, she learned much of the African-American community in the Central Ward from soon-to-be-elected Kenneth A. Gibson. Newark also was visited by Dublin's colorful Lord Mayor, Robert Briscoe, who spent a hectic 12 hours in town in the late 1940s representing not only Ireland, but also the newly emerged state of Israel. Perhaps no more colorful personality has ever visited City Hall and made such an impression as the Irish-Jewish Lord Mayor of Dublin, Ireland. Briscoe was treated with great deference by Mayor Leo Carlin and Gov. Robert Meyner. The Irishman's speech in Newark City Council chambers was greeted with wild applause. He was made an honorary Newarker and invited to lunch at Morven, the Governor's Princeton mansion, by Meyner. During a separate event, Dublin's Lord Mayor was applauded by the Essex County United Jewish Appeal for his support of Israel. At the City Hall affair on March 25, 1957, the mayors exchanged a pair of golden shamrock cuff links and a Waterford crystal pitcher. On November 1, 1995, Christy Mbonu from the Office of Consulate General of Nigeria visited Newark to kick off regular air service between Newark and Nigeria at Newark International Airport. Mayor Sharpe James proclaimed that day Nigerian Independence Day. On August 4, 1792, the great-grandson of Timothy and grandson of Sir Bysshe Shelley, Percy Bysshe Shelley was born in the family home at Field Place. He was educated at Sion House and Eton and later took his rightful place in the pantheon of great English writers we all studied during high school and college. While Shelley's grandfather seemed to have been interested in his grandson's literary possibilities, the administration was not mutual. Dislike is a mild way of describing the younger man's feelings about his grandfather. News of the grandfather's pending death brought the following response from the younger Shelley: 'I hear from my uncle that Sir Bysshe Shelley is not likely to live long – that he will soon die. He is a complete atheist, and builds his hopes on annihilation. He has acted very ill to his three wives. He is a bad man. I never had respect for him. I always regarded him as a curse on society. I shall not grieve at his death, I will not wear mourning.' Hard, cruel words for a grandfather, one-time Newarker and brilliant man. In spite of those feelings, Shelley gained materially from his grandfather's death. That inheritance provided him security that followed him the rest of his all-too-short life. Other members of the Newark area Shelleys included Edward Shelley, whose family had fought in the years of the Spanish Armada and who was related to John Blanchard of Elizabethtown; Benjamin Shelley, who was related to John Sutton of Peapack; and Giles Shelley, a sea captain, 'who was suspected of complicity in the illegal practices of Captain Kidd.' After Giles' death, his widow resettled in New Jersey where the family line died out without issue. In 1728, a headstone in the burial ground of the Old First Church was discovered bearing the inscription, 'John Shelley, departed Jan. 2, 1728.' Obviously the Shelleys cut a wide swath throughout not only colonial America but back home in merry old England. A king, a queen, a prince, a princess, a marquis, a diplomat, a lord and a country knight. All have added an uncommon touch to daily life in Newark, as have more recent visits of a president and a pope. Whether visited by royals, rulers or just regular people, the region remains an intriguing place to reside.